Dusk is the easier twilight to shoot, but it is no less rewarding. 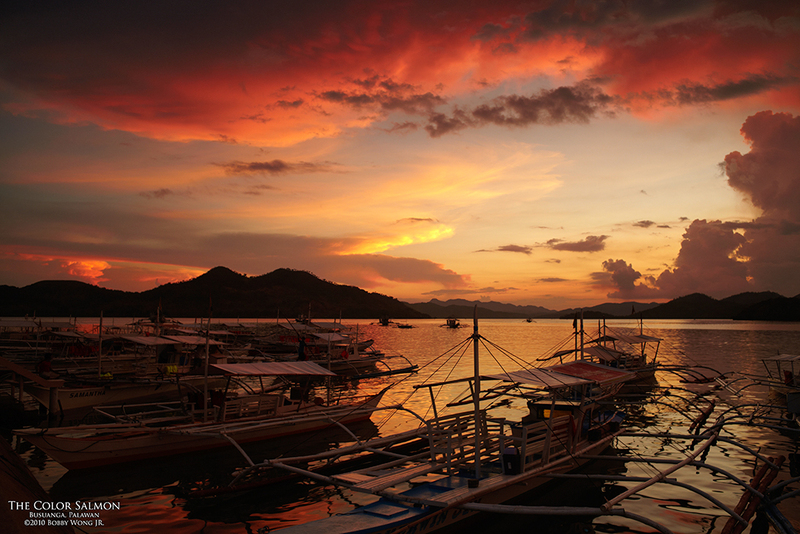 Still in Busuanga in Palawan, the sea port is a beehive of activity at sunset. As night falls, swarms of boats arrive from all directions, hustling to find their spot to dock. Out jump tourists and boatmen, but in their haste, few marvel the intensifying colors above. The dusk horizon is clear today with just enough clouds, enough canvass, for the sun to paint its farewell. In a few minutes it will be peak light, the most intensely colored moment of dusk. My equipment is ready, mind is prepared, but my heart still flutters at the thought. In a scene as dynamic as a port at twilight, one needs to move quickly to find a worthy composition. With so many moving parts, I try to find myself a strong element or two to anchor my composition... and then wait patiently for some action to enter the frame... like boats simultaneously lining-up on the horizon... or a boatman climbing from boat to boat until he reaches shore. And suddenly the sky's reflection magically appear in the water in front of me. Quickly. Click. A sigh of relief, another twilight bagged for posterity. Enjoy. Beautiful! It reminds me of early evening in a fishing village near the beach resort, Chateau DU Mer, Amoingon, Boac, Marinduque. Bobby, Have you been to Marinduque? It is a photographer's paradise, I believe! I've never seen this particular shade either. Glad you were there to capture it.